There has been some amazing work on a User Guide for Drupal 8 for about a year now, and the English version is in pretty good shape -- it's in the stage now of copy editing and image refinement, and it will find its home under drupal.org/documentation. To start the translation process off, we need to figure out a translation workflow that will make sense for translation teams. It doesn't make sense to use the same workflow as is used on https://localize.drupal.org for the short strings that are part of Drupal and contributed modules, themes, and distributions (see https://www.drupal.org/node/2762261 for details) -- the guide is about 100 pages of formatted text prose, not a bunch of short strings. We are looking for one or two teams initially to start using a proposed process for translation and provide honest feedback to improve the flow. This will help get the guide translated to as many languages as possible eventually. Translation not complete on Drupal 8 release day? No problem! First, I'd like to congratulate all teams who worked hard to get to significant completeness of Drupal 8 translations, lead by the Ukrainian and Hungarian teams who are 100% complete and the Spanish team which is close to complete too. The French, Dutch, Danish, Finnish, Japanese and Romanian teams were also hard at work and are all over 70% translated. When you are installing Drupal, there is no special task to do to install in any of the supported languages, just select that on the first screen. The translations ready at that time will be downloaded and used. Is it a problem at all though if a translation is not complete yet when you install? I don't think so. With prior Drupal core releases, there was a huge significance of complete translations at release time because whatever people used to install Drupal was used to create all their default configuration. Content types, fields, menus, input formats and so on. Even though we have the very handy Localization update module for Drupal 6 and 7, it could not help update configuration that was already created. In Drupal 8 we solved that problem by applying built-in translation updates to the shipped configuration as well, so if your translation does not have complete coverage yet for the shipped views, fields, contact forms, tours, etc. those will be updated later on seamlessly. Drupal also of course supports making local changes to those which would not be overwritten later with translation updates. To take advantage of this feature (which is not enabled by default), either run a manual update at Administration > Reports > Available translation updates or turn on automated updates with cron at Administration > Configuration > Regional and language > User interface translation and sit back and enjoy your Drupal 8 continually improving with translation fixes automatically. Read more about Translation not complete on Drupal 8 release day? No problem! Let's get it translated! Drupal 8 RC1 is here! You may have noticed that Drupal 8 RC1 was released last week. Great news! What does this mean for translators though? Well, quite a lot. The software interface strings in Drupal 8 are now frozen, which means that only error corrections, removals or additions of whole strings, and fixes required for critical issues may be made from this point forward. Read more about Let's get it translated! Drupal 8 RC1 is here! Test the staging version of localize.drupal.org on Drupal 7 NOW! Read more about Test the staging version of localize.drupal.org on Drupal 7 NOW! Time to start translating Drupal 8! Drupal 8 is in the beta releases stage getting closer to supporting an upgrade path. It is still in development and there are still some interface changes expected. As per the beta changes policy interface string are unfrozen and user experience improvements are prioritized. On the other hand, I don't know of major initiatives to change the interface strings and I believe most of the interface should be considered stable at this point. As we are getting close to releasing beta versions with support for the upgrade path, that means more sites will start to use pre-release versions of Drupal 8. This helps find bugs and we would love the multilingual system to be (even more) thoroughly tested as well. We need translations for that to happen. We also need translators to look at source strings, so they submit issues found in them. So while the user interface is not yet frozen, there are various good reasons to start translating Drupal 8 now. How fast should you plan to complete translations? Strings will likely be frozen with the first release candidate (which is cut when there are no more critical issues against Drupal 8). However that release candidate may become a release if no more critical issues found as early as a couple weeks after, so starting translation at RC1 would be too late to be ready for the release. You should consider starting sooner than later. To make that process easier, we introduced a new Drupal 8 translation status page at https://localize.drupal.org/translate/drupal8 which lists the languages by completion status based on the last exported Drupal 8 translations available. Congratulations to the Spanish, Danish and Finnish team for being the top three! We also made it easy to access the multilingual demo from that page and included some advice on translation readyness as well as a step by step guide to new contributors. You are encouraged to start translating Drupal 8, organize local translation sprints and test your translations by installing the new version in your own language. Big Drupal events like DrupalCon Bogota host multiple days of sprints where translators should join and take their space. The next big event coming up in Europe is Drupal Dev Days in April with a week of sprints. All of the new Drupal 8 APIs should be supported now on the site including default shipped configuration. If you find something on the Drupal 8 user interface that is not translatable, submit a Translation template extractor issue and tag with "Drupal 8 compatibility". Balu Ertl collected a list of 1200 "easy" Drupal 8 strings to translate to your language. These are 1, 2, 3 or 4 words long. 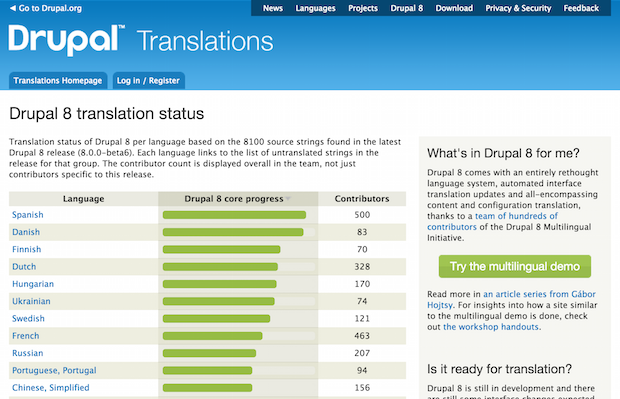 Download the complete Drupal 7 translation of your language. Using the Export tab on your language, export a full translation template (with untranslated and translated strings included) of Drupal 8. Use the gettext msgmerge tool to find fuzzy matches locally. Review and correct the translations locally. Finally import the new translations to the site with the "Multiple contributors" user for proper attribution. Thanks for making Drupal 8 happen! Read more about Time to start translating Drupal 8! There is a huge amount of exciting things happening around Drupal multilingual at DrupalCon Amsterdam. This time we'll have a meetup of all the people who love localize.drupal.org. The site seriously needs people who care about it enough to devote time to maintaining and fixing bugs. I set up this BoF to gather people interesting in the well-being of the site titled We love localize.drupal.org. As we kept following the changes made to Drupal 8 and the dozens of new ways of adding translatable strings to code in the new version, we worked on support for TWIG translation constructs and all kinds of YAML file sources (routing titles, menu items, action links, local tasks, configuration schemas, etc) recently as well as some misc new APIs like TranslationWrapper objects. Drupal 8 alpha releases are out - what does this mean for translators? Drupal 8.0 alpha2 is the first tagged release of Drupal 8 that comes with a package downloadable from drupal.org. What does this mean for Drupal software translators? Well, it means it is made directly available on localize.drupal.org for translation. We make tagged releases available so that translators don't need to chase a moving target. Read more about Drupal 8 alpha releases are out - what does this mean for translators? Would you miss email notifications on localize.drupal.org (temporarily)? As part of working on the site upgrade, our messaging and notifications system is discussed. Unfortunately we don't have a reliable number on how many people rely on email notifications from localize.drupal.org (due to automated signups) and the complexity of the upgrade process for notifications (given that we need to migrate to new modules) might set back our upgrade process even longer. Read more about Would you miss email notifications on localize.drupal.org (temporarily)? Who loves localize.drupal.org? New site maintainers needed! Localize.drupal.org is becoming one of the least taken care of properties on drupal.org. Although Sebastien Corbin does a heroic job preparing the Drupal 7 site upgrade, that is still off in the future. There are existing bugs (in translation packaging, project parsing, performance, etc). Noticed that the frontpage stats have been disabled for performance reasons for months? Yeah. There are infrastructure tasks and Sebastien also needs people to join porting the site to Drupal 7. Read more about Who loves localize.drupal.org? New site maintainers needed! Nodes. Entities. Taxonomies. Translate all of your content with Smartling. Learn how LucidChart built for growth through localization. Drupal is a registered trademark of Dries Buytaert. All translations are submitted under the GNU GPL v2 license.